On 28th September 2011, 12 of the 14 members of SEPAC will be launching their third joint stamp issue with one stamp from each postal administration. The common theme of the stamps will once again be ‘Scenery’. All the stamps bear the official SEPAC logo. 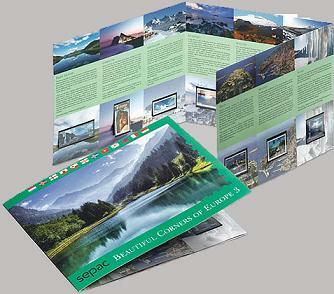 The stamps will be available in a joint Folder entitled ‘Beautiful Corners of Europe 3’. The Folder holds 12 stamps and gift coupons from each participating postal administration. The coupons can be mailed to the respective postal administrations to receive additional information and complimentary gifts. The limited edition of this exclusive Folder is 7670.